An exhaustive and affectionate, albeit admittedly biased, account of the life and legal work of one of the nation's greatest jurists. As Gunther correctly points out, although biographies of Supreme Court justices abound, very little attention is paid to the judges of the country's lower courts. Only a handful of these men and women become widely known or achieve lasting fame. 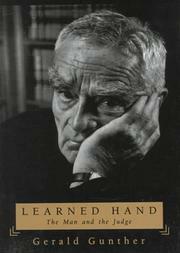 An exception is Billings Learned Hand (1872-1961), arguably the greatest United States judge never to sit on the highest court. Yet he had, as a judge on the Second Circuit Court of Appeals (covering New York), a far greater impact upon the law than many who served on the more august body. Using, for the first time, the voluminous private papers of Hand (at the request of the judge's son-in-law), Gunther, a noted constitutional scholar at Stanford University, delves deeply into the life of this remarkable individual. Born in Albany to a family that could trace its roots to the Mayflower, Hand attended Harvard College, then "drifted'' into Harvard Law School (he originally wanted to be a philosopher). After graduating he practiced law in his home town but eventually gravitated to Wall Street. Appointed to the federal bench in 1909 as a district court judge, Hand would decide one of the most influential free speech cases ever, the Masses Publishing Co. v. Patten decision of 1917, in which he protected dissident speech. He became an appellate judge in 1924 (eventually becoming chief judge) and quickly achieved prominence in American legal thought. He retired in 1951, after fighting against Cold War hysteria and McCarthyism from the bench. Former Supreme Court Justice Lewis Powell provides a foreword. An important work on an important figure, despite its reflection of the built-in prejudice of the biographer, who served as Hand's law clerk.